In order to run a profitable business, it's important to avoid payment barriers at checkout. Even if you prefer to have your customers pay by credit card, for example, you may need to enable alternate methods for specific cases. Let's say you have wholesale buyers, affiliates, or corporate partners who want to use a check or money order for bulk orders, but you don't want your other customers to be use those payment methods at checkout. The restricted payments feature allows you to create a method that's restricted to everyone by default, then choose the customers accounts that should be able to use it. Click the three-dot menu icon to expose the Payment Method Settings window. Under Allow Payment Method Restrictions?, select Yes. Click on the ID number for the payment method you want to edit. Select the Restrict Payment Method checkbox at the bottom of the payment method editing page. Click the three-dot menu icon and select Customize Columns. Make sure the Restrict Method checkbox is selected, then click Apply Changes. Hover over the Restrict Method column name and click Edit. 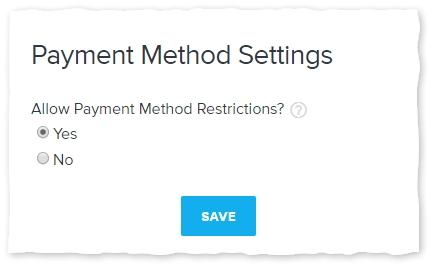 Select the checkbox next to each payment method you want to restrict. Click on the ID number for the appropriate customer account. In the Special Privileges section, click Select Allowed Payment Methods. 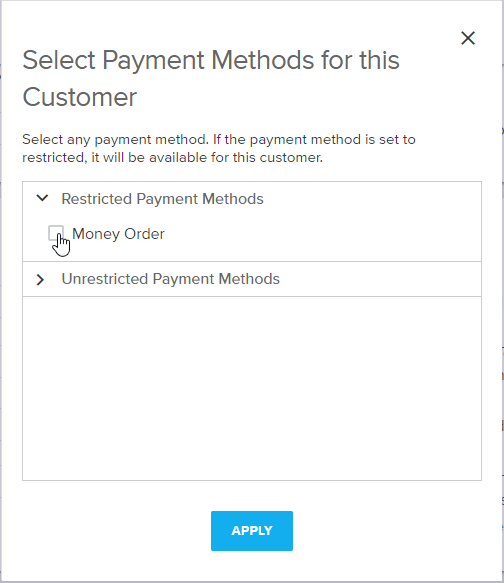 Click to expand the Restricted Payment Methods list, then check the box for each restricted payment method you'd like this customer to be able to use. When selecting specific payment methods for a customer, you'll also see a set of unrestricted payment methods. This list is only for reference: it shows all unrestricted payment methods in your store, including inactive methods. If you plan to make one of these methods restricted in the near future, and you want to ensure that the customer account you're editing can use it, you can pre-select the corresponding checkbox for that method. However, the method won't be restricted for other customers until you follow the steps in the previous section of this article. The restricted payments feature is a convenient tool for limiting how specific customers can pay you. For all the basics on collecting funds, see our main article on Managing Your Payment Settings.